Underwater granulation system is the most widely used granulation method at present. The underwater granulation system has many advantages, such as much processing materials, high output, small area, beautiful and uniform particles, and it is of great help to granulation operation. Some underwater granulation systems are fully automated, more convenient and more efficient. 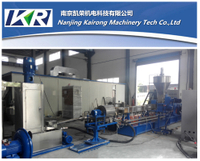 At present, there are mainly three kinds of underwater granulation system: PP PE PC ABS composite plastic granulator production line, two-stage PVC composite plastic granulator price, industrial plastic masterbatch parallel co-rotating twin-screw extruder. You can choose a suitable one according to your business characteristics. The granulation process is that the fine powder is dried and adhesive is added to make the particles with good fluidity and the particle size is about 0.1mm. Generally, the adhesive used should meet the following requirements: to have enough viscosity to ensure good formability and the mechanical strength of the billet; after high-temperature forging and burning can be all volatile, the body does not leave or less residual impurities of adhesive; The process is simple, non-corrosive and has no adverse effect on the performance of ceramics. The key of underwater granulator system is to break and granulate the rolled sheet, so that the particles with uniform particle size and high yield can be obtained. 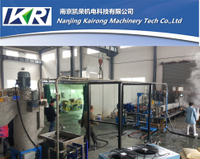 The company adopts the granulation structure of crushing flake material first, then rolling to screen through roller. It can greatly improve the production efficiency of finished products. The feeding structure of underwater granulator plays a decisive role in dry rolling and plate forming. In domestic feeding system, the special-shaped and unequal-distance screw is generally used for direct feeding, and a certain pre-pressure of the feeding screw is given during the feeding process, thus ensuring the hardness and thickness of the pressed material and making the pressed tablets meet the requirements. 1.The feed rate is high. In the dry granulation process, some physicochemical reactions took place in the feed due to the combined action of water, temperature and pressure, which resulted in starch gelatinization and the increase of enzyme activity, thus making the feed animal digest better and transforming it into weight gain. The feed conversion rate (10% / 12%) could be increased by feeding pig pellets and pigs with pellet feed after pelletizing underwater. The average daily gain, feed meat ratio and feed meat ratio were 4%, 6% and 3% / 10%, respectively. 2.Good mobility and easy management. Many powders, especially small-density cashmere feeds, usually add molasses or high fat or urea to the silo. Pellet feed is a popular large dairy cow or poultry farm, the underwater pelletizer which uses an automatic feed machine due to its good fluidity and little adhesion. After pelletizing underwater, the bulk density of feed can be increased by 40% / 100%, the storage can be reduced and the transportation cost can be saved. 4.Kill Salmonella in animal feed. Salmonella remains in animal tissue after ingestion. People who eat animals infected with bacteria develop salmonella gastropathy. High temperature steam quenching and granulation in underwater granulation process can kill Salmonella in animal feed. 5.Avoid the picky eating of animals. Compound feed formula has a variety of raw materials, nutrition, can prevent animals from the powder to choose their favorite ingredients, with other components of the phenomenon. The feed loss can be reduced by 8% and 10% due to the uniformity of the pellet in the storage, transportation and feeding process of the underwater pelletizer. 6.Avoid automatic classification of feed ingredients and reduce environmental pollution. In the process of powder storage and transportation, due to the different volume and quality of various powders, it is easy to be graded. After underwater granulation, feed ingredients are not graded, granular materials are not easy to dust. In the feeding process, the air and water pollution of granular materials is less than that of powder materials. l If you want the particle shape to be spherical rather than cylindrical, the best option is to use an underwater hot surface granulator. The production capacity of the underwater pelletizer system varies from 20 lb / h to several tons per hour and is suitable for materials that exhibit various thermoplastic behaviors. l During the underwater pelletizer operation, the polymer melt is divided into ring bars, which flow through the ring die into the cutting chamber full of water for production. The rotating cutter head in the current cuts the polymer strip into particles and delivers it quickly out of the chamber. The particles are transported to centrifugal drying equipment in the form of slurry and open with water under the action of rotating blade. The dried particles are removed and transported to subsequent processes. Water is filtered, adjusted, and recycled back into the underwater pelletizer process. l The main components of the underwater pelletizer system include cutter head with cutting chamber, template and start-up valve, all of which are mounted on a general purpose support frame to form a whole part. All other system components, such as by-pass production water circuits, cutting chamber unloading mechanisms, observation holes, centrifugal drying equipment, belt vacuum filters, pumps, heat exchangers and transmission systems, Can be selected in a wide range of auxiliary components and integrated into a set of task-specific systems. With the continuous development of the economy, people's production and living standards continue to improve, and energy conservation and emission reduction are advocated. The sustainable development of underwater pelletizers has become particularly important. The construction of pelletizing hobs must follow the law of sustainable development. The current hob follows the law of sustainable development and brings great convenience to enterprises that need to use hobs. When you choose the right underwater pelletizing system, your product will have more advantages than a normal pelletizing system. And the source of a mature product must be a mature system.